The more people you ask about what drives the gin-boom, the wider the answers. Some say it’s the versatility; gin’s agreeable to cocktails and easy in a long drink. Terroir is common in wines and whisky, but gradually it’s creeping into gin too – and that’s worth celebrating, as we search for brands with authentic stories rooted in a local place. For others, the pace of innovation in gin means that the category is forever interesting and offers something fresh. Copper Rivet Distillery ticks all of those boxes. It’s a place where all of those arguments are correct, nor definitive. Where all the cogs mesh to create something bigger. The sense of things coming together is key at Copper Rivet and to understand the brand and its gin, you first of all have to know the family and their home. Meet Bob Russell and his sons Matthew and Stephen. Bob opened Toppers Wine Bar, in Rainham in 1979. More than a wine bar, Bob imported and sold wines and spirits. A fascination with drinks was born. It’s fine having good people behind the brand, but not much use without a home… Pumphouse no.5 might sound like a terrible riff on Mambo no.5, but, thankfully, it’s the location chosen by the Russell’s for their distillery. Matthew spotted the then vacant building when visiting Upnor Castle. Looking across the River Medway, he noticed what is today the home of the brand. Situated on the river banks, in Chatham, Kent, the family have come a long way since then. Rolling up to the distillery, it’s easy to get carried away simply by the aesthetics. The distillery is housed in a vibrant Victorian red-brick, with boats of all shapes and sizes bobbing around. The building was originally completed in 1873 and housed cutting-edge hydraulic technology. From the outside, life is steady, but inside the distillery the pace of innovation is frighteningly quick. This might be a family business, but it’s anything but quaint. 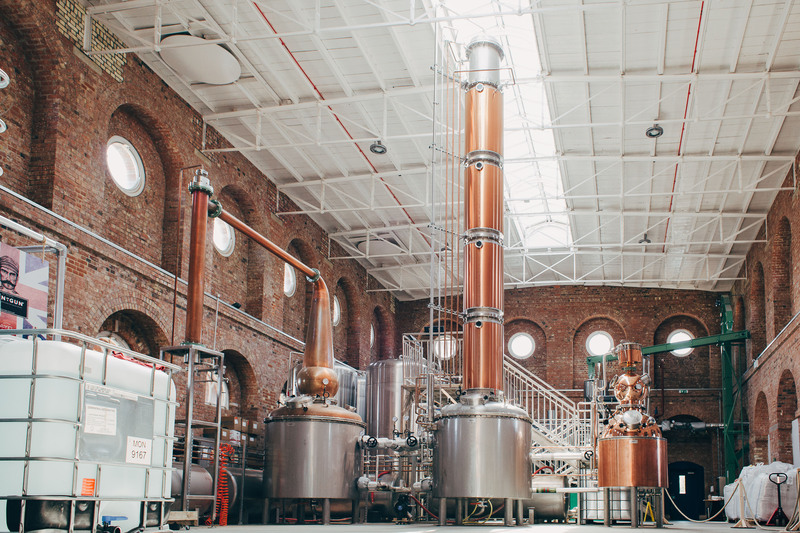 The sheer scale of the distillery is eye-opening and a vision of copper, steel and brickwork, with the industrial character of Chatham’s history oozing from the stills. Copper Rivet Distillery is one of just a few distilleries in the UK to distil from grain to glass. While not a slight to other distilleries, this means complete control and ensures that spirits are distinct and as local as you want. The neutral grain spirit is hyper-local, with Copper Rivet electing to use Kent farmers, Burden Brothers for their grains. The grains are harvested and travel the short distance from farm to distillery, where milling takes place on site. The spent grains from distillation are fed back to the cattle who graze on the Burden Brothers’ farm. it became in the 80s once the dockyard was closed. Being one of the few grain to glass spirit makers in the country, we’re obsessed with quality and want to make spirits that both we and local people can be proud of. The dockyard plays a special role in Copper Rivet’s spirit range, with Dockyard Gin the name of the hero premium gin. Described as a contemporary take on a traditional naval gin, the 41.2% ABV Dockyard Gin uses botanicals including: juniper, locally sourced elderflower, coriander seeds, orange and lemon peel, green cardamom, grains of paradise, angelica root and orris root. The master distiller at Copper Rivet is Abhi Banik. Banik decided on the recipe for Dockyard Gin based on numerous tastings with the Russells. The result is a lightly floral gin, with prominent juniper, that leads into a creamy pepper with grapefruit. Banik created the design for the still, named Joyce, who is a 300l beauty, made in Chatham and designed to make the heating process more delicate. The gin bottle takes cues from Chatham’s industrial and naval heritage. At the bottom are eight squares spelling out, ‘Dockyard’, in maritime signals. On the label are motifs reading ‘Kent, England’, ‘Royal Dockyard Chatham, Kent’, and ‘Handcrafted from local grains’, giving a clue about the ethos. Duly, the stopper resembles a copper rivet. Tours are offered to visitors eager to taste Dockyard Gin and the distillery’s other spirits. Best of all, there’s a tasting at the conclusion, before a gin and tonic in the visitor centre or on the Distiller’s Lawn. It’s not just gin at Copper Rivet, with a vodka, grain spirit and whisky, which is ageing in innovative cask trials, awaiting its moment. The spirit of innovation in the air around Chatham now ages the Copper Rivet spirits. For now, the moment belongs to Dockyard Gin. It’s an appropriate end, raising a glass of gin inspired by that which gives it its name. Sticking with the spirit of industry these simple cocktails using Copper Rivet’s Dockyard Gin deserve to be tried at home.